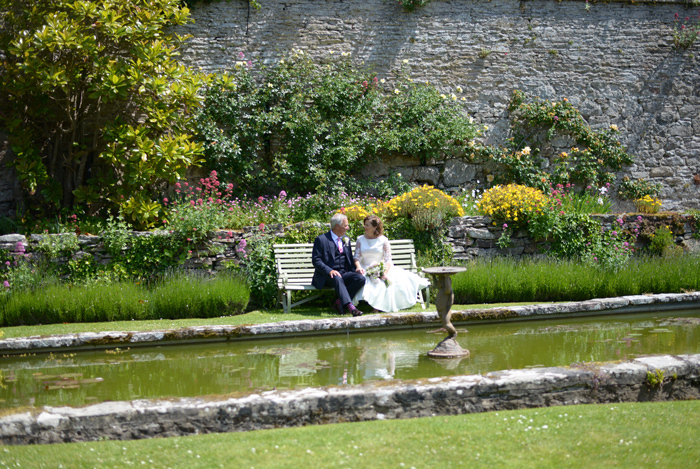 Steve and Gail were married at Bodysgallen Hall, which is located just outside Llandudno in North Wales. The Hall is a manor house steeped in history, providing plenty of opportunities for atmospheric photography. For Steve and Gail's wedding, the glorious weather gave us an opportunity to make the most of the hall's wonderful gardens. After Jane, our female photographer, carried out a series of images of the bride getting ready, we all decamped to the Wynn Room for the ceremony. Then it was a case of choosing all the best parts of the gardens to make the most of the location. As you can see from the images, Bodysgallen Hall provides plenty of lovely locations for wedding photography. But the day was made all the more special by all the little details created by Steve and Gail. We particularly loved the colour scheme, with the dusky pinks of the flowers complementing the soft sage green of the bridesmaids' dresses. We also liked Gail's classic Hollywood glamour, with a beautiful Dior-style dress and a splash of red lipstick. And we'd definitely recommend the venue to anyone considering a medium-sized wedding. The Wynn Room is a pretty space, while the Hall's interior and exterior provides plenty of scope for romantic pictures.